Before going into the game play, I’d like to add something I missed out in my last post about the in-game shop. Each purchase you make in that shop earns you Cosmic Points. These points act as a sort of loyalty card system unlocking extra items and perks the more you have. This news article on the Wildstar blog goes into it in more detail. 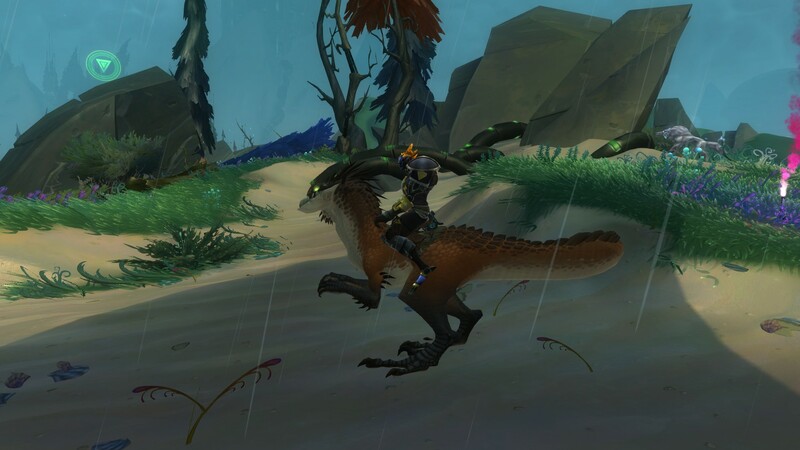 It’s also worth mentioning that if, like me, you brought Wildstar on release when it came out last year, you appear to get jumped up to tier 3 in Cosmic points, as I already had the Warpig of the Devoted and Badlands Velocifrex (pictured below), as well as the other items, appearing in my account inventory when I logged in. Onto the game itself then! First of all, it is important to mention that going Free to Play has not hurt Wildstar’s core game play. If anything, the intervening year has allowed Carbine to clean up a few of the issues that were around at launch, as well as re-balance a lot of the classes and abilities (Engineer being most noticeable for me, as it was the class I played the most during launch). Now I approach most MMO’s with one intent in mind: “I am going to tank that”, so after logging on, taking a quick look over the other tank classes, then disregarding them and picking engineer again (What can I say, I’m a sucker for large guns and robot minions) I hopped on and started the leveling process. The first thing I noticed is that after character creation I’m asked to specify my experience with MMO’s from three options: New to MMOs, New to Wildstar, or Wildstar Veteran. 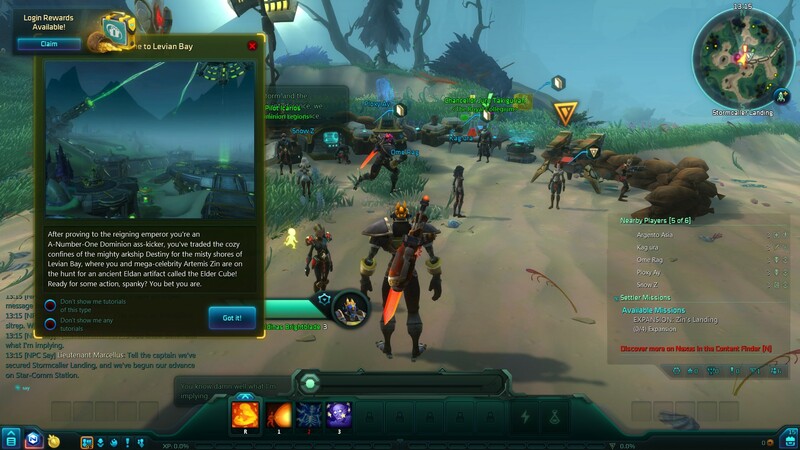 Selecting Wildstar veteran allows you to completely skip the ship-based tutorial level, and drops you onto Nexus at level 3 with your basic abilities made available. To start with, levels 1-6 are pretty much standard MMO fair. Grab quest, kill, collect or activate the relevant item, hand in quest, rinse and repeat. The combat keeps everything moving at a fair old rate, and I never found myself staying in one area for too long. Also every time you level up the game lets you know what new items, abilities and content you’ve unlocked as well, so you can always find something to do. Once I hit level 6 I unlocked my first Expedition (previously called Shiphands): Fragment Zero. These missions can be joined via the content finder, and take you and two others (3 players in total) to an instanced area where you get to partake in a themed story line. These Expeditions are designed around all players being DPS classes, and do not require a tank or a healer. That said, I still rocked up in my tanking gear and did my best to keep the swarms of enemies focused on me rather than my allies. 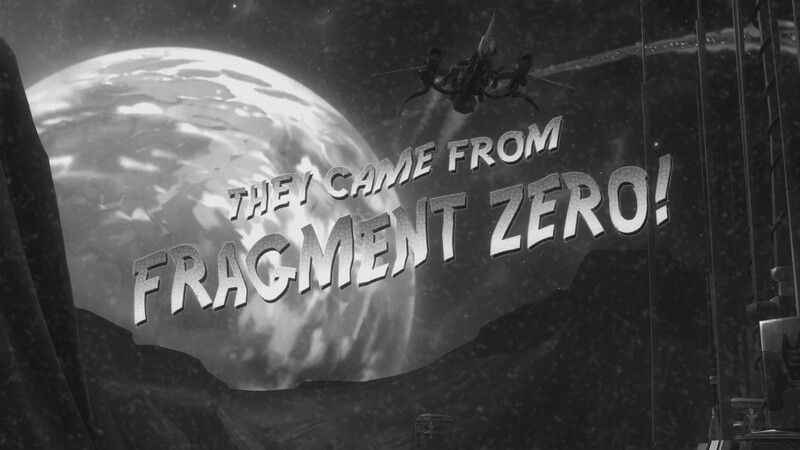 I found these to be insanely fun, and have re-run Fragment Zero a few times with both random players from the content finder, as well as friends. Another cool feature of these missions is that if you are over the required level, you are scaled down accordingly, allowing you to play them with your lower level friends and not have to worry about stomping all over everything. After gaining a few more levels I hit level 10, which unlocks the first 5 player dungeon event: The Protostar Academy. This piqued my interest as I had heard about it when the content drop first hit back early last year. 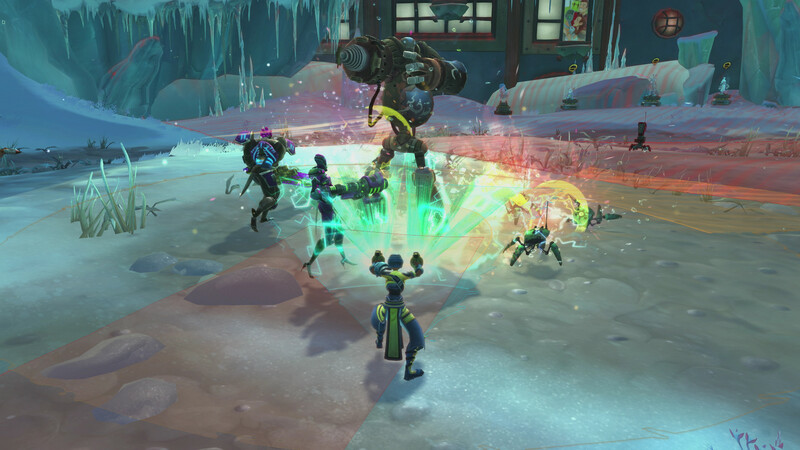 The Academy is designed to teach new players the basics of dungeon combat in Wildstar, and I must say it does an exceptionally good job at this. The way it works is that you and 4 others (1 Tank, 1 Healer, 3 DPS) are dropped into a specially crafted training environment, where a Protostar employee hovers around overhead walking you through each encounter and providing advice/warnings about what is happening. The first boss teaches you about interrupting an enemy, and explains how the interrupt armor and moments of opportunity work. It’s also the place where I’ve experienced the most wipes, as a lot of players don’t understand how their stun ability works, and either fail to use it or miss the target, meaning the boss is able to complete his spell and kill the group. Fear not however, the resurrection point is near as this is all part of the training, and the game pops up some advice windows on how interrupts work to explain it in more detail. I found a lot of the time simply talking to the other players in my group was enough to help them understand, and I really only encountered one complete arse of a player who got rather rude before leaving the group. Thankfully he was replaced by someone who was a lot more polite, and who helped me explain how the Esper stun worked to our other Esper, meaning on the next attempt we nailed that boss to the wall. After mastering stuns and interrupt armor, the next few fights take this mechanic and build on it, adding things like staying out of the red (in this game danger areas are telegraphed in a red shape on the floor that should be avoided), and hiding in safe zones to avoid large-scale AoE attacks. After the first 3 fights you then change to the next arena, which continues on the lessons. In the next fight tanks are expected to hold aggro of a large enemy, as well as pick up smaller ones, the DPS need to change focus to burst down a large explosive than randomly appears, then switch back to the main target, and the healer keeps everyone alive. The next few fights continue to build on this concept as well as the ones from the first arena, with a variety of extra adds, large red zones, and additional safe zones. Let’s just say that by the 3rd fight in the second arena (6th fight in total), you’ll be dancing all over the place to avoid various attacks and get into the safe zones! The final area is an actual boss fight, where you and your team must work together and use everything that you have learned to take down a boss. There’s no hand holding from Protostar here, you must observe, avoid, and when the time is right, beat the boss in the face for MASSIVE DAMAGE! *ahem*. All in all I felt this tutorial dungeon did a fantastic job of what let Wildstar down on launch: Teaching players how to work as a team. 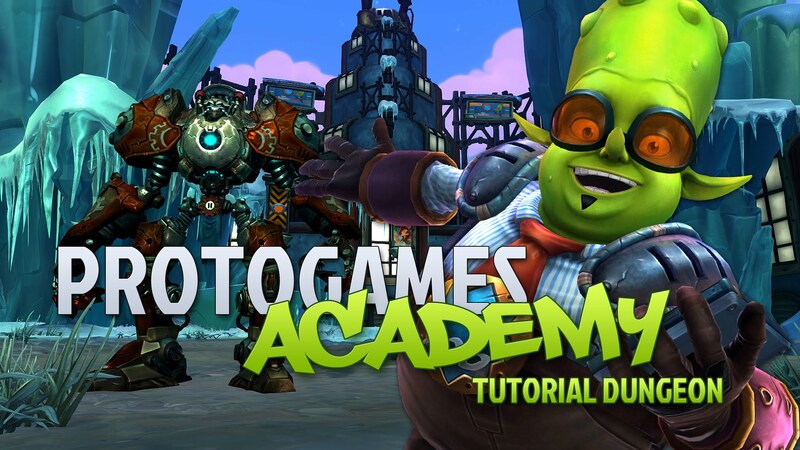 Sure those of us who are MMO veterans know a lot of what the game teaches, but for those who are unsure, or are new to MMO’s or Wildstar in general, this training dungeon lets you learn in a safe and (relatively) painless environment. The worst thing you’ll encounter in this dungeon are people who don’t seem to understand the concept of a training dungeon to help you learn, and in the 4 or 5 runs I’ve done of this dungeon so far, that seemed to be one person, and even the rest of the group agreed he was being an unreasonable arse. So far I’ve really had nothing bad to say about Wildstar, and I’ll probably make a few more of these posts as I continue to level and encounter new challenges, meet new people, and generally tear the place up! 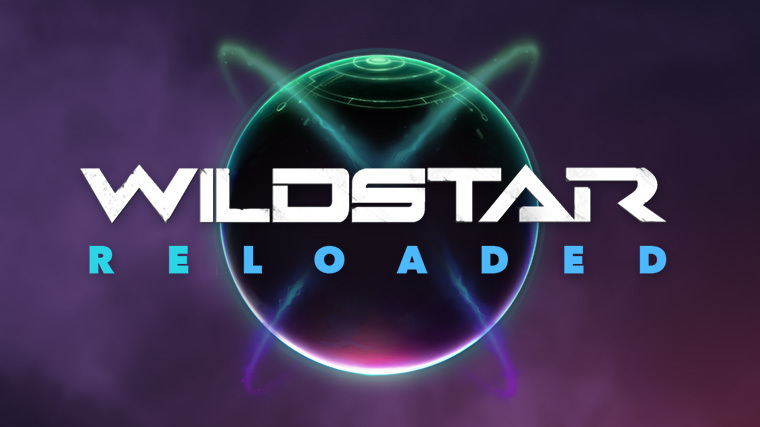 Don’t forget, Wildstar is free to play, so if you’ve not already done so, why not check it out? Part 1 – Looking at the free to play model and in-game cash shop. This entry was posted on Thursday, October 8th, 2015 at 10:05 am by Jason and is filed under Blog. You can follow any responses to this entry through the RSS 2.0 feed. You can leave a response, or trackback from your own site.